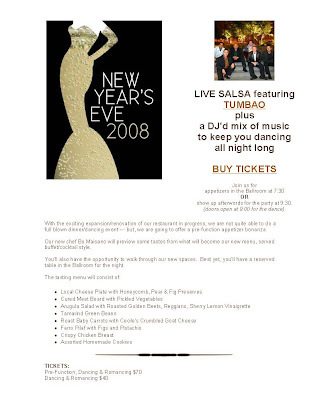 Click on the above image for more info and for tickets! Everybody have a fantastic and safe New Year's celebration! Another discovery today in the world of Washington State Agriculture: business resources for the Spanish-speaking farmer! The Washington State Department of Agriculture has produced a five-disc set of audio CDs - (10) 30-minute segments on business and financial planning, marketing, crop insurance, good farm practices, safe use of pesticides, food safety, alternative energy, and state and federal farm projects. These were produced with assistance from Washington State University (previously known as Washington College of Agriculture, if I recall correctly!). The set, called Risk Management Strategies for Farm Businesses: Information for Latino Farmers in Washington State, can be ordered FREE by contacting Patrice Barrentine at smallfarms@agr.wa.gov or by phone at (360) 902-2057. Also try Malaquias Flores, Latino outreach coordinator for the WSU Small Farms Project, at (866) 978-9165. OK - I just learned about a really cool program offered through Wenatchee Valley College. The Bilingual Agriculture Education Program offers a variety of courses for Spanish-speaking orchard employees, including an introduction to horticulture, advanced horitculture, IPM technician, farm management, and introduction of viticulture. Also offered are pesticide license and forklift certification workshops and other continued education. About 700 students have gone through the program since it began 16 years ago! What's more, Wenatchee Valley College has an agreement with Washington State University which enables students to put credits toward a Bachelor's degree. This is just a fantastic way for our state's Latinos to further their careers and their opportunities. Kudos to Wenatchee Valley College! Hola - just got an interesting bite from a prospective client. Turns out, his business already has Spanish-speaking staff in place to support his intended Hispanic marketing efforts. Kudos to you, Brent! We're letting you in on a little secret here: If you'd like to attract Latino consumers, start by putting an infrastructure in place (customer-facing staff, printed materials such as contracts, phone IVRU, etc) *before* you place that ad in Spanish-language media or even display that Spanish-language poster. Think about it: Nothing's more disappointing than thinking that you'll get the service you need, when really all the company had for you is a poster in the window. Plaza Bank is one of those rare businesses in our area that was built on the premise of truly serving Latinos (versus simply attracting them). Of course, most companies weren't founded on this premise, but that doesn't exempt them from making their very best effort to provide high-touch support to Latinos they do attract. >> If you have questions about what this means for your business, just give us a ring at 206-621-2185 or write info@conexion-marketing.com. We've been looking into the effects of the current economic downturn on Latinos statewide and Gigi came across this current Yakima Herald article. I like the title (and significance) of it: There's No Stopping the Shopping for Valley Latinos. Neat coverage of Hispanic culture in The Seattle Times! and this Quinceañera story, on yesterday's front page! 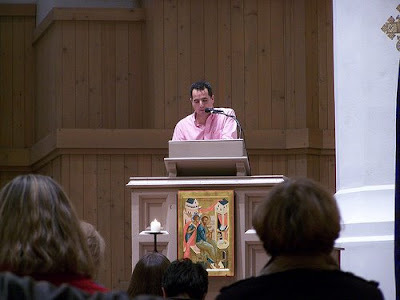 Above is my old friend Alfredo Feregrino, who gave a sermon at the Our Lady of Guadalupe Spanish-language service at St. Mark's Cathedral up on Capitol Hill, December 14. He tells me that despite the inclement weather, there was great attendance at this first annual event and most of the performers showed up. There was a group from Oaxaca that performed the Danza de la Pluma (Dance of the Feather, literally translated) and also La Banda Gozona. 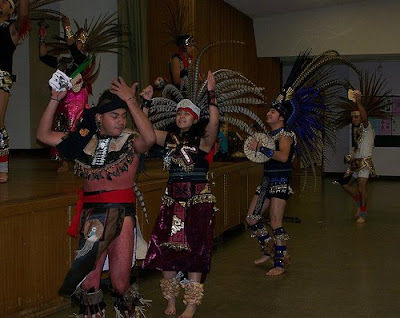 So this was a service flavored with indigenous roots and unlike any other Our Lady of Guadalupe celebration in Seattle! And...apparently Alfredo and our friend from KCTS/V-Me, Tony Gomez, played some music together! Wish we could've been there! Liz Jones at KUOW did an interesting story yesterday on Seattle-area day laborers and the impact that our current construction industry woes are having on that particular community. Apparently, the growth attached to the Olympic Games in Vancouver BC is looking pretty appealing right about now to construction workers. Check it out: Seattle Day Laborers Head to Canada. The flip side of this story is that, because other areas of our economy are still stronger than those of neighboring and border states, we'll likely see some immigration. The Bill and Melinda Gates Foundation is providing a scholarship opportunity for "low income African American, American Indian/Alaska Native, Asian Pacific Islander American, and Hispanic American students with an opportunity to complete an undergraduate college education in any discipline area of interest. Continuing Gates Millennium Scholars may request funding for a graduate degree program in one of the following discipline areas: education, engineering, library science, mathematics, public health or science." This is an on-going opportunity so if the January 12, 2009 deadline does not work for this year, this opportunity is likely to be repeated next year and it would appear from the description that disadvantaged students majoring in public health or science are preferred. I'll take this moment while I'm stuck in a Spokane, WA hotel to tell you why I know that translations are ¡pero, muy importante! At Conexión Marketing, we do a lot of work with the Spanish language. In fact, nearly all the creative we're involved with is in Spanish, targeting the U.S. Hispanic market. We do our own original copywriting in Spanish, as well as translation management. Many times, our clients come to us with a translation they've been provided by a third party. Sometimes these translations work just fine; other times they're just not good or (GASP!) clearly Internet-generated translations. (That's a definite NO-NO!) Sometimes the mistake isn't syntactical, but cultural. And our favorite (those who know Spanish will see the humor in this one): a client who provided the translation for "fro" (as in "afro") as "vaivén." This term can refer to something that waves do in the ocean, for example. ?? We couldn't figure out this one until we did some research. The dictionary showed one definition of "vaivén" as "to and fro." Even non-Spanish speakers will see how very wrong this is, because the "translator" took the term "fro" completely out of context. It made absolutely no sense! To top it off, the above examples are from brands you all know! Of course, we scrutinize all copy, whether we've managed the translation job ourselves, or are provided with a translation the client would like us to work from. It's always included in our service. We've found that it ends up costing the client less money, and certainly less time and trouble, to get a correct and culturally relevant translation in the first place. Think about it: If you wanted some copy written for your website, would you just turn to the first person who happens to speak English to write that copy for you? Well, this is what we've seen over years and years in the business! Our clients suggest that they have someone on staff (not a writer, not a creative) who "speaks Spanish." Sometimes that person isn't even a native Speaker! Sometimes they have not formally studied the language, so while their conversational abilities are just fine, they are not qualified to write your copy. That neighbor who's from south of the border, or that staff person who is a native speaker, may give you a really "good deal," but you must think of your translations as an investment. You don't want a "good deal," you want it done right. The language you employ--be it in your advertising, on your website, on your voice greetings--reflects your very brand. Make sure it speaks to your audience the right way in every language you take on. I'll be back again later today with more! Stay warm, dry and safe! Las Posadas - any comments? OK so I missed El Rey's Posadas event yesterday (thanks, snow) so if anyone reading attended, please comment on the event! Was it fun? Worthwhile? Specific comments are appreciated! Just post your comment here, or if you're feeling shy, you can email me directly at lauri@conexion-marketing.com. Hope everyone stayed safe and warm this chilly weekend. Welcome back to the workweek! What a terrific opportunity - now students can complete their GED in Spanish if they so choose, thanks to a new program at Seattle Central Community College! Students enrolled in the GED classes will be required to enroll in ESL classes as well. English classes are on Mondays and Wednesdays (or in the mornings), and GED classes are on Tuesdays and Thursdays. All classes run from 6:00p.m. – 8:20p.m. Classes cost $25 for the quarter (three months). For more information, visit the Basic & Transitional Studies office in Room 3122 or call us at 206-587-4180. 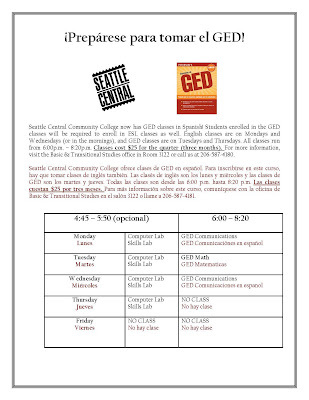 Help Seattle Central spread the word about this opportunity for more students to earn their GED and enjoy greater potential--for themselves, their careers, their families! 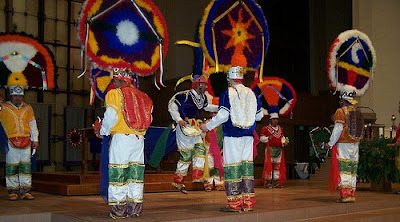 This Sunday 12-4 Seattle Central will be present at the Las Posadas event in White Center at Evolución (16th & Roxbury). Talk to them about this possibility! And enjoy our first annual El Rey Las Posadas--toys and games for all ages, live music, free food--what more could you want? There is still a chance to see them at the Chapel at Bastyr University (14500 Juanita Drive NE, Bothell) this Saturday, December 13th. DID YOU KNOW about Las Posadas? It's a nine-day celebration, beginning December 16 and ending December 24. It symbolizes the troubles Mary and Joseph endured trying to find a place to stay when traveling to Bethlehem. I believe its origins are in Puerto Rico, but you can correct me if it's practiced elsewhere. During this event, children and adults (the pilgrims) go from house to house singing a traditional song and requesting lodging (posada). In each house, the owner responds with refusal (also in song), until they reach the designated site for the party, where the owner welcomes them. Pilgrims carry small lit candles, the head of the procession will have a candle inside a paper lamp shade, or farolito. Pilgrims pray and sing traditional Christmas songs, a party for adults and children follows, including the traditional piñata. Well, our local El Rey radio station is celebration Las Posadas this year--a first, this Sunday! If you want info on the event, please email me at lauri@conexion-marketing.com. Our friends from Seattle Central Community College are helping sponsor the event. If anyone else is involved, feel free to comment here or shoot me an email--I'd love to hear all about it! 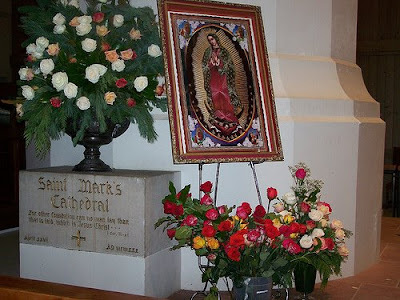 SPREAD THE WORD: Our Lady of Guadalupe will be celebrated in style at St. Mark's Cathedral this Sunday, starting at 3:30pm. For information please contact Alfredo Feregrino at aferegrino@aol.com. The Bill & Melinda Gates Foundation said it will give nearly $70 million in grants to aid Hispanic education efforts concentrating in New York City, New Mexico and California. The Seattle-based foundation said the goal is to double the number of low-income students who earn a degree by age 26, or an increase of about 250,000 graduates each year. “Hispanics continue to grow as a proportion of the labor force, and yet they are not getting the postsecondary degrees that will prepare them to excel in the modern economy. With these new grants, organizations will be able to help more young people get through college,” said Gil Conchas, senior program officer with the Gates Foundation, in a statement. 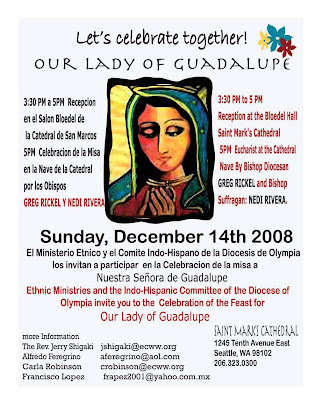 Seattle University is holding the Feast of Our Lady of Guadalupe this Wednesday, December 10th at 12:05 pm in the Chapel of St. Ignatius. If you haven't yet visited this amazing chapel on the SU campus, just off Madison and 12th, take the opportunity to celebrate this occasion while surrounded by natural elements and award-winning architecture. In the Roman Catholic Church calendar, December 12th is the feast of Our Lady of Guadalupe which is also celebrated as a major religious holiday in Mexico. This date is the anniversary of the Mexican Indian Juan Diego's second encounter with the Blessed Virgin Mary on Tepeyac Hill outside Mexico City in 1531. Resident Minister Maria Ochoa will share reflections on the readings for the feast in Spanish. Need to Relax? Need to Network, Too? CHECK THIS OUT! Join Professional Women of Color Network for a Joint Women's Business Networking Spa Event! Not only will you hear from speakers and mentors, but a spa service is included in your registration! How's that for an excuse to get pampered? Several organizations are getting together with Professional Women of Color Network to put this event on, including my personal fave, Women Business Owners. See http://www.pwocn.org/ for more info and to register! This should be a great way to spend your Sunday evening -- a Seattle Pro Musica concert featuring Christmas music in Spanish as well as indigenous languages from Latin America. If you're like me and enjoy cultural events, please join me in making this one a success! So yesterday was the Leadership Luncheon for the Girl Scouts of Western Washington. It was a terrific event and very well-attended. I loved talking to the girls about their roles in the event: some sang, some spoke. They wore their sashes with pride! The organization is clearly reaching out to a multicultural population of girls, as was illustrated by the video shown at the event as well as the scouts in attendance. I was impressed by the Hispanic initiatives that this organization is committed to. María Alejandra Gómez is the Latina Program Coordinator, and she showed me all the stuff Girl Scouts are doing to meet the needs of Latino families in Western WA. Yes, they've got practically everything translated into Spanish, but it goes beyond that. It's not just about recruiting Latina girls; it's a program that supports their success as Girl Scouts! María Alejandra has been actively seeking opportunities in the community to share the story--on local Univision 51, at the Latino Youth Summit in Olympia, at Mariners games. In fact, they've increased Hispanic participation in troops in East King County by 26% this year! If you would like to volunteer to help change the life of a girl, a troop, a community--call María Alejandra Gómez at 425-614-1126.